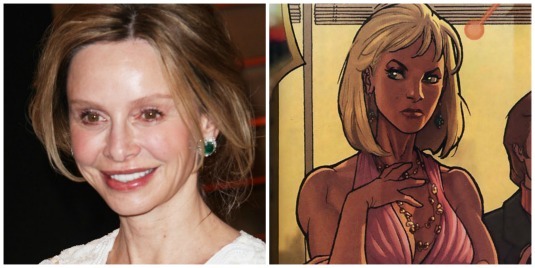 Calista Flockhart Joins Cast For ‘Supergirl’!!!! In the hangover glow of the Oscars morning-after, it’s back to business-as-usual for the studios. In that vein, CBS has announced some casting info for the hotly anticipated ‘Supergirl‘ pilot. Calista Flockhart is someone we remember as Kitty Walker from ‘Brothers & Sisters‘, or if you’re OK with dating yourself, there was the dancing baby from her show ‘Ally McBeal‘, well now she’s ready to take on the mantle of Cat Grant, a self-made media magnate and founder of CatCo. where Kara Zor-El (Melissa Benoist) works as her assistant. Cat began her career as a gossip columnist only weeks fresh from a divorce and move, she has built her company into a global powerhouse. Catherine ‘Cat’ Grant has been a part of DC comic fodder since 1987 and her story crosses with Superman’s as a potential love interest adding dimension to the Superman-Lois Lane dynamic. Her character has been a part of other televised Super-canon such as ‘Smallville‘ and ‘Lois and Clark‘. The series will follow Superman’s cousin, Kara as she decides to embrace her super-abilities and be the hero she was born to be by learning from her cousin’s example. Flockhart joins Benoist in a cast that also includes Mehcad Brooks as Jimmy Olsen and Laura Bernanti as Kara’s mother. ‘Supergirl’ Season One Can Be Yours On DVD and Blu-ray In August!!! Dean Cain and Helen Slater Will Be In ‘Supergirl’ Pilot!!! ‘Supergirl’ Series Finds Their Kara Zor-El in Melissa Benoist!!! CBS Taking ‘Supergirl’ On for Series Commitment!!! This entry was posted on Monday, February 23rd, 2015 at 5:01 pm	and is filed under Comics, News, Television. You can follow any responses to this entry through the RSS 2.0 feed. You can skip to the end and leave a response. Pinging is currently not allowed. « Wesley Snipes Set To Star in TV Series ‘Endgame’! I noticed that you have three X's on the back of your neck. That's appropriate, since you're looking at three strikes.